Last Saturday, I had a ball chatting with The Tolkien Professor and Dave Kale about digital humanities, scholarly collaboration, and words analysis of The Hobbit. During our broadcast, we raised about $3K for Signum University, and I’m tickled pick that the folks in the audience enjoyed our word-geekery as much as Dave and I did. Thank you for attending, sending in your questions, and best of all, participating in the little graph-guessing game that I created. My next task is to put up those words we graphed and add them to the concordance. Want to watch the show? A question came up while I was listening to the rebroadcast at https://www.youtube.com/watch?v=Mki9I57O5Bk (I like Christmas on Friday; lots of free time!) I decided to take Prof. Olsen’s smackdown as a challenge. Have you done any really-basic statistics on the text? I’d like to see the pattern of how many words are in each sentence as the story goes on. 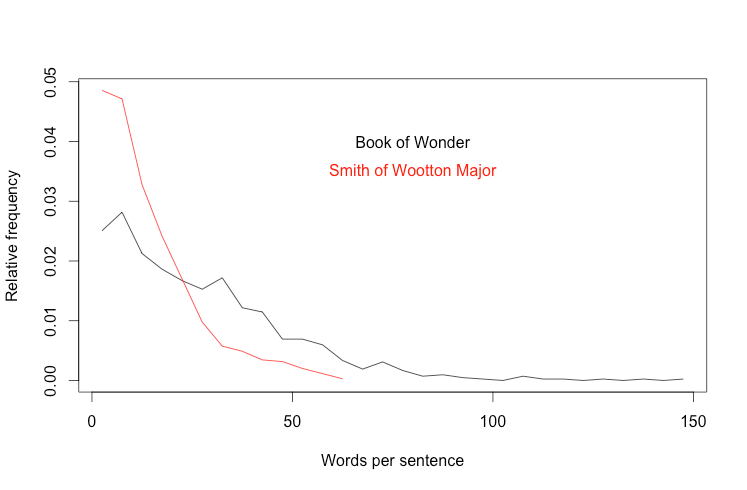 I know JRRT played games with sentence-length for emphasis in LotR — does he do it in The Hobbit as well?